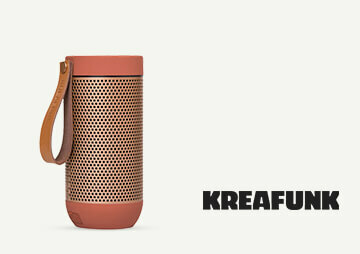 Enjoy superb sound wherever you are with the Kreafunk aMOVE Bluetooth Speaker. Featuring a handy power bank function and a built-in microphone for hands-free phone calls, the Bluetooth speaker is small and compact yet boasts a big sound and appealing good looks. Simply connect the aMove to your Bluetooth smartphone and take your music with you.